Pen Pal: The great little pen holder that you can stick anywhere! Pen PalTM – The great little pen holder you can stick anywhere – was developed by people who were tired of looking for a pen when they needed one. Whether in a car, at home or in the office it seems that we are always in search of a pen. The reason for this is there is generally no specific place to keep one, therefore pens are regularly set down anywhere making them hard to locate when needed. One of the most common places where this is a problem is in the car. If you need a pen while in your car, it can not only be frustrating but dangerous to look for one, as eyes are often taken off of the road. Pen Pal is also great for use at your computer, telephone, calendar, on exercise equipment, on a boat or airplane and any other place where you regularly need a pen. Pen Pal is a very simple product with a valuable purpose: to provide a fixed location where a pen can be easily and conveniently stored. It has a strong adhesive backing that allows it to adhere to most surfaces and its unique design gives it the ability to securely hold a variety of pen sizes up to a standard sized Sharpie marker. 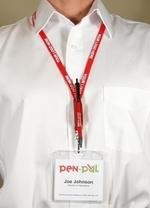 Additionally, Pen Pal's design was perfected to hold a pen securely while at the same time allowing the pen to be easily inserted and removed from the holder. Get a few and stick them around your home, car and office and see if this clever idea doesn’t put a little smile on your face.